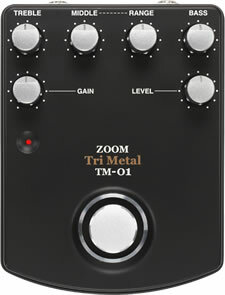 This ZOOM Tri-Metal TM-01 is an analog distortion pedal built in a rock solid frame to last. . These pedals have been discontinued by ZOOM, they were built very solid with amazing overdrive and clean bypass. The Tri-metal is widely adjustable but well known for its insane metal drive, these pedal are awsome! The TM-01 Tri Metal uses its three stage cascading gain circuit to accentuate heavy phrases as it is best matched for lower register and 7-string guitar voicings. Power Chords maintain detail and leads soar with well defined distortion. Ergonomically designed rugged all metal box, gain, level and tone controls, a status LED and runs on a 9V battery or can be powered by optional an AC Adaptor. -Analog circuit, delivering ultra HIGH-GAIN while maintaining LOW-NOISE. -Separate TREBLE & BASS equalizer control. Pingin bikin sendiri efek metal, tidak salahnya kalau Anda coba clone dari efek Zoom Tri Metal TM-01 berikut ini. cool pedal. Is the layout verified? What’s the switching type? Millenium Bypass or normal true bypass? Can’t see GND. berapa ya…cuma hobi aja mas. all of the schematic simble are the true zoom tri sir? all of the 5 ic are jrc4558 or tlo72 sir? Excellent unit, makes me very happy. klo agan jual PCB+kit nya tolong sms harganya ya gan 083811442829, soalnya saya jrg OL,,, thx b’4. aku ndak menghapus kok bos! cuma memang comment perlu dikonfirmasi/allowed manual, krn kl ndak gitu akan banyak spam masuk. gitu bos! gan ane udah kira2 kalo buat musik metal yg cocok kit yg mana ya? kalo menurut agan mending aq bikin yg mana ya? the potentiometer (middle) is not 100k, but 10k !! awarded the original. I don’t find it on the schem and I don’t understand what’s its utility?!! Thanks for your answer and your awesome project!!! gan ane mau tanya punya kalau effek buat radio rig.kira” pake apa yg paling enak di dengar.